Master Bedroom 10'3" x 9'1"
En Suite 7'1" x 4'7"
Bedroom 2 8'2" x 10'5"
The Alderley is a 2 bedroom semi-detached bungalow with a clever design and parking space towards the front of the property. 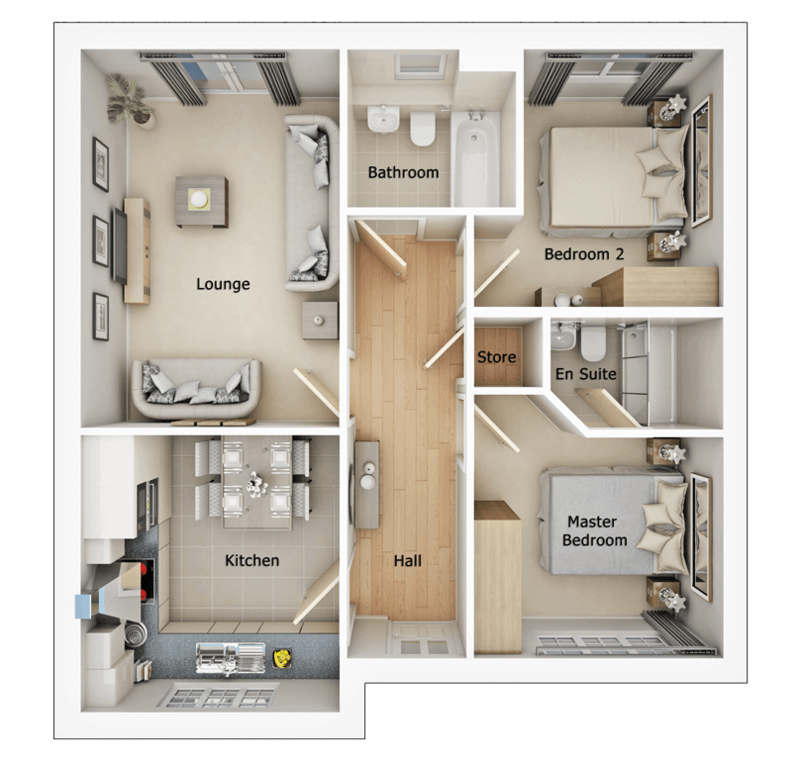 The layout consists of a lounge area, kitchen, master bedroom with en-suite, a second large bedroom and main bathroom, plus a helpful storage cupboard in the hallway to give you even more space. As well as the overall layout, the Alderley has a number of finishing touches to add to its offering. The kitchen features a 5 ring gas hob with single electric oven, an integrated washer, and integrated 70/30 fridge freezer. Ceramic tiling adorns the kitchen floors and hardwearing, high-quality laminate covers the worktops. You can choose from 6 rigid-built kitchen collections with soft close doors and drawers, and the units will come with the added benefit of under-pelmet LED lights and chrome LED downlights. Blossom Gate is Seddon Homes’ new homes development off Back Lane in Congleton. There are 10 Alderleys available to reserve, although all are currently off plan. So, why choose Blossom Gate as your new neighbourhood? Well, for starters, Blossom Gate is ideally located near to the Radnor Park industrial estate, making it perfect for those who commute to work there. It is also within a short 5 – 10 minute drive of a Tesco Superstore, ALDI and Morrisons, so you’ll have plenty of choices when it comes to the weekly shop. The kids will be happy, too, because Blossom Gate is just a 20 minute walk from Congleton High School, and a 10 minute walk from Black Firs Primary School. However, if you haven’t got any little ones or they’ve flown the coop, then Blossom Gate still has plenty to offer. The Daneside Theatre, cricket club and football club are a short drive away and there are many different places to visit for a lovely meal or quiet drink. Why buy a new bungalow in Congleton? Congleton is the ideal place to settle down. The market town has its fair share of exciting events, such as Congleton Unplugged, the Congleton Triathalon and the Food and Drink Festival, as well as a plethora of places to visit for a quiet day out. It has fantastic connections to Manchester and Stoke yet is still only a short distance from the Peak District National Park. The best of both worlds, you’ll always find something to do in Congleton. Congleton has an abundance of local amenities for new home buyers. The area is served by many supermarkets, such as Tesco, ALDI, Morrisons and Co-op, plus a variety of eateries, big and small. Bars and pubs are plentiful if you’re looking for something to do in the evening and the local sports clubs and leisure centres will help you stay fit and healthy. If you have pets, Charter Vets is right nearby to give you expert service and care. There is a host of cultural activities to enjoy in Congleton, too – the museum, Biddulph Grange Garden and Little Moreton Hall are all fabulous days out for a dose of history, and there’s plenty more to discover for yourself. Congleton has envious connections to a number of business parks, industrial estates and commerce hubs throughout the North West and Midlands. The ones that are local, Radnor Park and Daneside, are very close to Blossom Gate, and have a variety of B2B and B2C companies working from them. However, the large cities of Machester, Liverpool, and Stoke-on-Trent are also within an easy commuting distance, making Congleton the perfect middle ground for those who move around a lot for work. By travelling along Congleton Road, you can reach Stoke-on-Trent to the south, and Manchester Airport to the north. This handy road leads off onto a multitude of other A roads, making transport in and out of Congleton incredibly easy. However, if you don’t drive, then the area is also well-served by public buses and a train line which also runs through Manchester and Stoke-on-Trent. 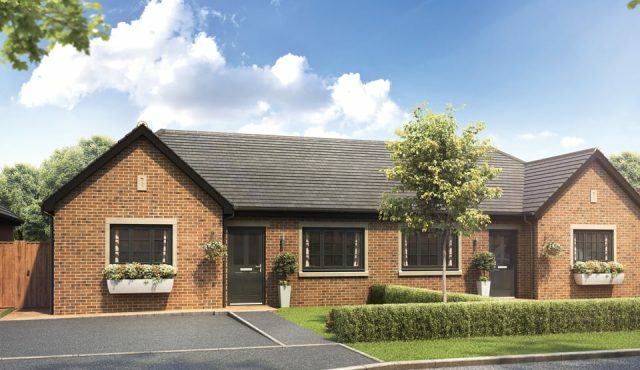 If the idea of life in Congleton has taken your fancy and you’d like to view one of our stunning bungalows, then why not contact us for more information? Our property shops are open as per the times on the development page, and our knowledgable staff are on hand to answer any questions you may have about the area, payment options, or whatever you might need to make the move.